Benjamin Lamah (middle), who came to the U.S. from Guinea eight years ago, was one of 109 Utahns naturalized as U.S. citizens and honored at the Utah State Capitol on Friday. That is how Benjamin Lamah described his feelings Friday as he and scores of other Utahns were naturalized as U.S. citizens and honored at the state Capitol. Lamah, a Utah resident who came to the United States from Guinea eight years ago, was one of 110 immigrants – representing 41 nations – who were celebrated by Utah officials, including state Rep. Norm Thurston, R-Provo, and U.S. Rep. Mia Love, and presented documentation of their citizenship by U.S. Citizenship and Immigration Services (USCIS). Benjamin Lamah (middle) became a naturalized U.S. citizen on Friday along with 109 others who were honored at the Utah State Capitol. “Give yourself a hand,” Love, the daughter of Haitian immigrants, told the citizenship candidates. In his keynote speech, graphic designer and naturalized citizen Chris Mann, from the United Kingdom, told the new U.S. citizens to appreciate their cultural differences that make them unique and bring diversity to the country. Friday’s ceremony honored citizenship candidates from American Samoa, Argentina, Australia, Bolivia, Brazil, Canada, Egypt, Germany, Guatemala, Iran, Iraq, Mexico, Thailand and other nations. “I’m feeling great, really,” agreed Asif Ghouri, another newly naturalized citizen who came to the U.S. from Pakistan four years ago. Even before receiving his citizenship, Ghouri became a certified nurse and currently works at the University of Utah’s Huntsman Cancer Institute. The most difficult part of achieving citizenship? Asif Ghouri, who came to the U.S. from Pakistan four years ago, became a naturalized U.S. citizen on Friday. Earlier this week, The Tribune reported that Utah’s backlog of legal immigrants waiting for approval of U.S. citizenship applications grew faster than in any other state in 2017. As of now, the waiting time to have a citizenship application reviewed is up to 20 months. Julieta Rosales from Mexico, who has lived in the United States for seven years, said she also felt it had been a long process. But she said she is proud of herself for getting through it, and “grateful that this country opened the doors for me and my family to be here,” she added. 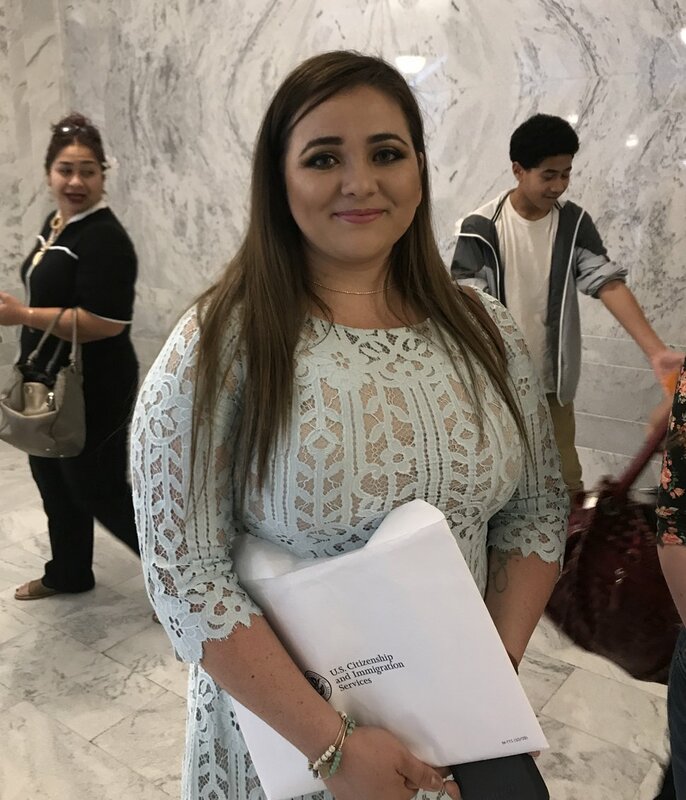 (Connor Richards | The Salt Lake Tribune) Julieta Rosales, from Mexico, says she is ready to vote and get involved with the community now that she is a naturalized citizen. In the state of Utah, approximately 5,800 people became U.S. citizens in the 2017 fiscal year, according to Debbie Cannon, a public affairs officer for USCIS. That same year, more than 716,000 people across the country became naturalized U.S. citizens.